What does failure mean to you? If it is something that stirs fear within you, then it is time for you to start using a better definition of ‘failure.’ For many failure is one of the most dreaded words in the English language. Everyone is so terrified of the possibility of failure. The very idea of failing is enough to stop most people in their tracks. It can cause most to hide their heads and run away, to not try. Failing to make the attempt is the ‘real’ failure and that doing nothing, produces nothing – least of all success. Yet many of you no doubt allows the fear of failure to keeping you back from you’re your professional and life goals. How ridiculous can that be. If we don’t try, we can’t possibly succeed, and success is something most people want. They yearn for it more than anything else. This definition and its meaning is why failure put the fear of god into people. It is questionable whether it is the failure itself that scares them the most, or other people seeing them as a failure because of it. Whatever the reasons, this fear of failure is a powerful force that will hinder your progress and hold you back from chasing your dreams, stopping you from accomplishing many of your life goals. It is why you need to start using a better definition of failure. 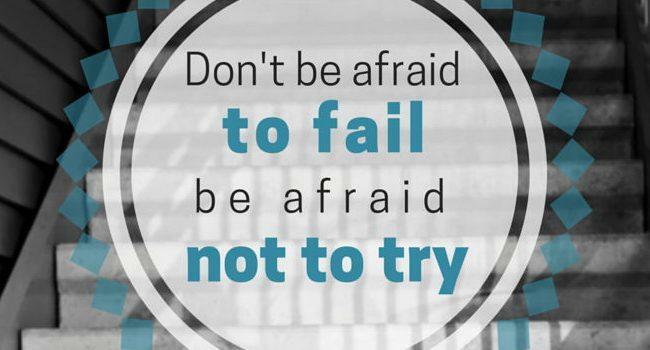 You need to lessen the fear of failure. To do this you need to begin to understand it is a necessary step to success. I want you to begin looking at failure in a different light. Using a different. More positive and better definition of failure. •An opportunity for creative change and innovation”. With this definition you can see failure is not something to be feared. It contains a positive challenge for successful living. Today’s failures contain the seeds of tomorrow’s greatest successes. It is said you must fail early, fail fast, fail often. So, the ﬁrst step to mastering the art of failing successfully is to begin to see failure and success in a whole new light and using a better definition of failure. Realize that there really is no failure. If something doesn’t work, you just try something else until you succeed. With this interpretation you surely will give yourself the mindset to fight on no matter how bad your perceived failure may be. If you feel like you’re at the end the road with nowhere to go, realize you are wrong. Failure is not falling down; failure is staying down when you have the choice to get back up. Sometimes you have to fail a thousand times to succeed. Which means you haven’t really failed yet; you’ve just found a bunch of ways that don’t work. You can either let failure prevent you from moving forward or you can utilize it to propel you to more success than you ever imagined. All that is required is that you learn from it. Don’t get so hung up on a few failed attempts that you miss every new opportunity coming your way. All of your ideas that don’t work are simply stepping stones on your way to the one idea that does. Failure must never be viewed as the end of the story but instead as a stepping-stone that will eventually lead to success. If someone never fails, this is a telltale sign that he is not trying anything new or challenging. Keep pursuing success, and be willing to fail, because it will only be temporary. We are all inspired by motivational quotes and I share some of my favourite ones on the subject of failure to hopefully ensure you see failure in a more positive light. Without a doubt one of the most important factors behind success is learning from our mistakes and accepting our failures. A well-lived and successful life will be ﬁlled with both ups and downs. Our personal growth and development requires us to fail some of the time, but if we learn from these failures and stay the course, we will eventually succeed.